Some superyachts hide their true nature with conventional white exteriors and timeless lines that, while handsome, give absolutely nothing away as to what lies within or how they will be used. The new Princess 30M Kohuba is not one of these yachts. For a clue to her ethos one has only to look up at the flybridge, where you’ll often find a motorcycle perched at the very edge, encased in a custom-made glass box like a rare collector’s item on display for all to see. Hints that this is one big boy’s toy are far more subtle once you’re inside, but Kohuba has already revealed her hand. Refined masculinity rather than dark man-cave won out for the interior as the Princess Design Studio guided the owner’s vision for a smoking room motif and lightened it considerably. From the custom-made motorcycle enclosure to the bespoke design process, UK builder Princess Yachts has proved once again that it means business with its semi-custom M Class range. 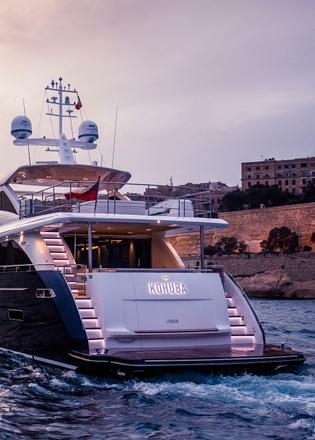 Kohuba is the first Princess 30M, the smallest in Princess’s semi-custom fleet, falling in line behind the World Superyacht Award-winning 35M, launched just last year, and the 40M. The 30M replaces the 32M in the series and stands apart from its predecessor in more than just length overall, boasting an entirely new hull design, more practical layout and larger tender garage. 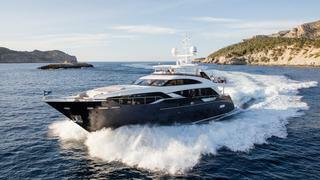 Olesinski developed the naval architecture, propulsion, exterior design and interior layout for the 30M, incorporating large-yacht features and familial traits shared among all Princess yachts. 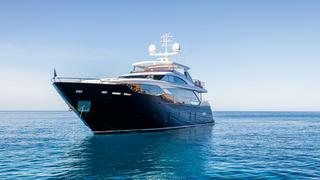 Like her sisters, the 30M has refined, dynamic lines, accentuated by her dark blue hull. Even at 30 metres, she employs big custom superyacht features including expansive glazing, an optional balcony, sizeable tender garage and engine room, lifting swim platform and crew accommodation set forward. This not only allows the various teams to get their jobs done without getting in one another’s way, but it’s what helps to make the boat so quiet, because each module is then fitted on anti-vibration polymer foam, much like a floating interior found on larger superyachts. At 30.45 metres length overall, the 30M is a sweet spot for an owner who is ready to go a little bigger and enter a different world of superyacht comfort, styling and customisation, yet still get their boat quickly. Kohuba has twin MTU 16V 2000 M94s, which offer a maximum speed of 25 to 27 knots. 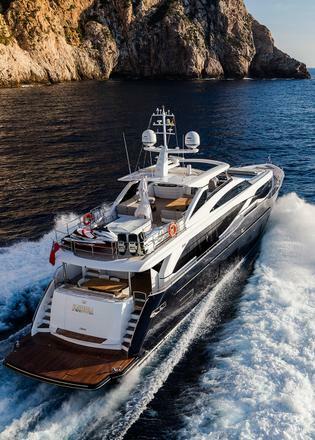 Kohuba’s owner, stepping up from his current Princess 72, is a prime example. Where his 72 had quite a dark interior, the Princess Design Studio interpreted his brief for masculine, Scandinavian design on Kohuba and imbued it with pale tones, creating a sophisticated, light-filled space. 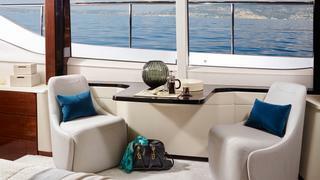 The interior is a well executed blend of dark woods, deep blue leathers with greys and beige soft goods. There is a prevalence of glossy walnut — high gloss is making a comeback at the moment as Princess attests it’s the most popular choice among owners. 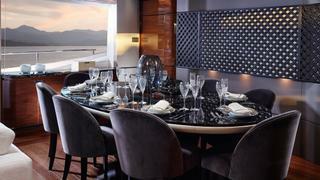 The owner also specified some rare stones for the main deck sideboards, inlaid rugs on the main deck and a dark wenge timber floor. Tactile materials are used skilfully — for example, the feature wall in the lower deck foyer has Venetian plasterwork crafted by artisans in London and bespoke to Kohuba. 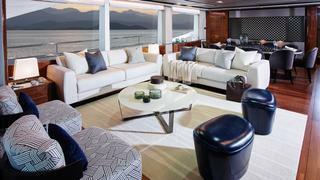 At first glance the lower deck layout seems standard, with two doubles and two twins opening off a foyer, but the rooms feel much larger than you’d expect on a 30 metre yacht. The huge picture-box windows can be thanked for this, as can the well proportioned en suites, and each cabin has a small desk, ideal for work or beauty routines. What’s especially clever is the twin cabins are convertible to doubles with the inboard bed sliding outboard, electrically operated by the touch of a button. This versatility is ideal for chartering, which Kohuba will be doing. 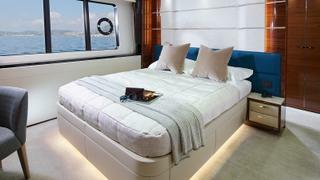 The best berth in the house is the main deck master cabin, of course (and what a master for a 30 metre!) An enormous skylight, which can be closed by electric blinds, and large windows let plentiful light in, giving the space a penthouse vibe. The bulwarks outside are angled to match the shape of the master windows, providing undisturbed views, while the deck level itself is high enough that anyone passing on the way to the foredeck can’t actually see into the master, ensuring privacy. There’s a “man cave” touch here, too: a bar and fridge is built into the port side by the bed for that very necessary nightcap. The floating table to starboard is inspired by private jet interiors and the chairs are loose but sculpted to be slid perfectly into place. Both pieces are created in-house by Princess. 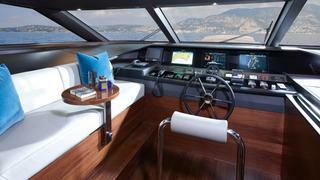 The yard also designed the motorcycle display unit, created to blend with the yacht’s standard design features. The owner wanted to be able to show off his motorcycle at events in the Mediterranean and offload it easily to take to the road at ports around the world. Made of double-curvature glass and glass-reinforced plastic with stainless steel supports, the case is visually pleasing and practical. It can be lifted via a crane on the aft deck and set on the deck. The case opens and the bike rolls out. The case then transforms into a bar for dockside entertaining. The bike can be used when the yacht charters, or it can stay on shore. When the motorcycle and its case aren’t on board, rails are inserted into the aft deck and the space can instead host a Jet Ski. 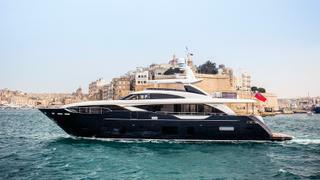 To accommodate the glass case, the flybridge was redesigned with the superyacht spa pool turned athwartships to make room. 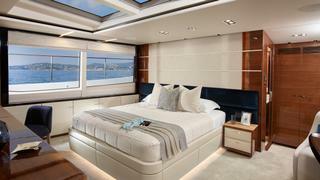 There are two L-shaped settees forward of this, facing a TV screen that raises from behind the helm seats so the entire flybridge can be transformed into an outdoor cinema. The 30M was held to the same high standards as her sisterships when it came to performance — and then some. “The 30M is designed to get up on the plane at much lower speeds and be much more efficient compared to the 32M,” says Edwards. The hull lines were developed using Olesinski’s unique Hull & Hydro software. “The state-of-the-art hull form was optimised using the latest in computational fluid dynamic techniques, a series of towing tank tests and with reference to our extensive database of successful designs,” says Olesinski. “We achieved a balance between maximum long-range cruising efficiency without compromising top speed or the quality of the ride.” Her official top speed may be 27 knots but on sea trials Kohuba exceeded that, and on journeys facing swells of four metres she has proven to be stable and comfortable. This bodes well for an owner who plans to use his new toy often with family and his big group of friends, some of whom tagged along on the many occasions he visited the yard during build. “I have not known an owner to come to the shipyard as much as he did,” says Edwards. “He just really enjoyed the experience of looking at his boat in process, talking about the specifications and seeing how it was coming along. And every time he came there was a new friend in the group!” Now the boys can enjoy the finished product and never have to choose between boat or bike — when both are ready for adventure. First published in the July 2016 edition of Boat International.